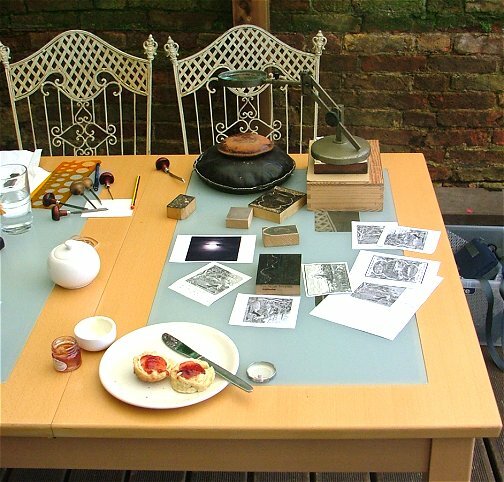 I returned to my exhibition after lunch so that I could demonstrate the noble art of engraving. Peter had set aside a table out on the terrace that proved perfect. Since, like most printmakers, I work in isolation, it was a pleasure to be out and about and chatting about the process of making the images that are on display. I decided to carry on with my owl - featured months ago. I cut the outside of the block into a gothic arch and started to use stippling to attempt to show a halo around the moon in the background. 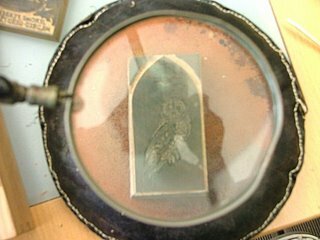 The photograph that I took - looking through my magnifying glass - is not that clear but the print will feature in further entries in this blog. During the afternoon, I took a break after Peter supplied a plate of scones, cream and strawberry jam. This is just what engravers of a certain age need to sustain them during an afternoon of engraving! This was a very pleasant afternoon. I don't often have the opportunity to show how I do what I do and to talk to the people who are buying my things. We are planning another demonstration - probably in two weeks time. The exhibition continues to be very successful. We have sold just under half the works in the first two days. With a month to go, I am starting to hope for a sell out. 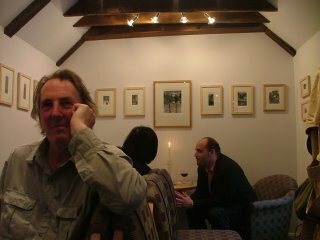 The "Private View" of my exhibition was a great success last night. It was lovely to see old friends and great to see those red dots appearing on the works as they sold. 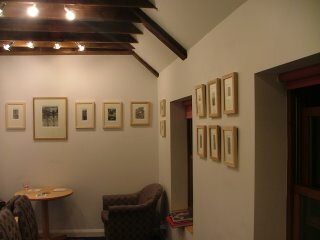 It was a frantic day - I was actually half an hour late for my own show as I was still sorting out the unframed engravings. 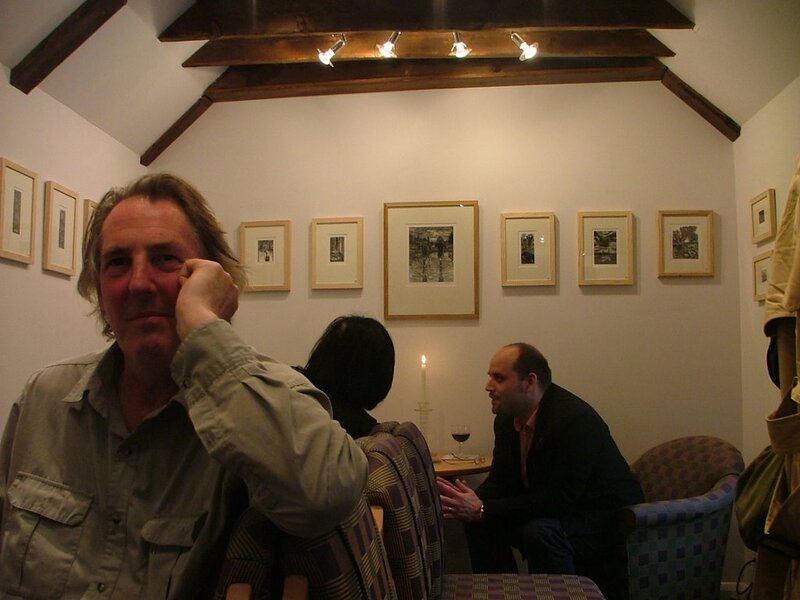 When I arrived at the gallery, I could finally relax. The exhibition was looking good and I tried to find the time to chat to everyone. A is back on his feet again and took photographs for me. At the end of the evening, I took the opportunity to take my own photographs of the empty rooms. Only then did I realise how hungry I was and so J and I walked the short distance to find a restaurant that was still serving food. Find "Latest News" on the drop-down menu from the "Home" tab. Yes - its finally online. No images of engravings in the gallery yet but they will follow shortly. Back to work after a few days at the coast. It was good to relax but now unto the breach, dear friends. While I was there, I collected my new set of exhibition frames. I am very pleased with them; they are simple, square profiled planed ash. The engravings will look superb in them. Pictures to follow. I returned home to a treat - my first ever ripe fig from the garden, eaten and enjoyed straight from the tree. I know that this is nothing to some readers, but seems to me to be another facet of our changing climate. The lemon tree is also producing fruit in quantity and I look forwards to a garden "g and t" with fresh lemon slices later in the year. Sadly, no olives yet. The Mediterranean certainly seems closer, in terms of climate. Today's job is framing (again) and I hope to break the back of it this morning. Writing this is a bit of a distraction for me as A in on the operating table as I write and I won't be able to settle until I hear how things are. All being well - including the weather - tonight will include not only a fatherly visit to hospital to see the hairy son, but then open air Shakespeare (Romeo & Juliet) in the gardens of Girton College, Cambridge. Yesterday, I pointed my new domain name at the servers and so I hope that the website will be "live" in a few hours. I will announce with suitable fanfare as soon as this happens. And now, back to the framing. It is weeks since I posted here. I imagined that, after the end of term, I would be able to write a nice chatty blog every day. As it happens, I have been working long hours catching up with jobs in hand. My "retirement" could not have been more pleasant with good wishes, cards, presents, dinners, speeches and visits from old students. 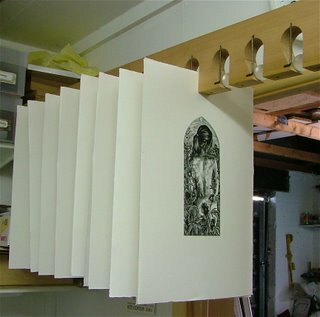 My colleagues gave me a wonderful Lawrence's print drying rack. I love the old technology - wood, wire and glass marbles. I still need to hang it from the studio ceiling but I am already putting it to good use. The last week left me exhausted, especially the clearing of 26 years of accumulated materials. I used cupboards at college to store trays of type and my childhood fossil collection, among other things. I have so many jobs under way that is it difficult to finish one. I am gradually getting through them, working on a strictly first come - first served basis. I will be emailing over the next couple of days to update everybody on progress with their particular job. Everything will have settled down by the end of the month and new jobs will have a much faster turnaround than before. I have an exhibition at Ely in Cambridgeshire, UK which starts on 25th August and carries on until 30th September. It is at the three cups gallery. I hope that some readers will be able to visit during the month. I will give more details in a few days. There we go; just about caught up here - if only I had in real life!